Once a bizarre fiefdom of gangsters. It’s been a year since I roved Roosevelt Island, the oblong spit of land in the middle of the East River between the Upper East Side and Astoria. It’s possible to walk from Queens to Manhattan via the island, using the spindly lift bridge at 36th Ave. and Vernon Blvd., which leads to the island’s parking garage, then walking down to NYC’s only tramway, and accessing 2nd Ave. for the price of a subway ride. I proceeded to the island’s northern end, which I hadn’t laid eyes on since conducting a tour there in 2005, and then headed back to Queens via the subway, which arrived on the island in 1989. Since 1971 Roosevelt Island has been a small town of about 8300 people in the midst of a huge city—an island in the borough of Manhattan. Native-Americans called the island Minnehanak ("Long Island"), and the Dutch called it Varkens, or Hog Island; but it’s had a variety of names in English: Blackwell’s Island since 1686, Welfare Island in 1921, and finally, since 1973, Roosevelt Island, after a memorial to FDR that was going to be built in the 1970s and finally opened a few years ago. In 1828 the first of the island’s lengthy succession of asylums, penitentiaries and hospitals opened; its isolation in the East River gave NYC a convenient place to stash dangerous or contagiously ill people. By the 1920s and 1930s the Island had become a bizarre fiefdom of gangsters serving time in the neglectful tenure of Joseph McCann, who ran Blackwell Penitentiary. The mobsters were able to have the comforts of home smuggled in and lived like kings amid the deteriorating, squalid conditions surrounding them. The penitentiary was closed and moved to Rikers Island in 1935. By the 1930s the era of institutionalization on Welfare Island was winding down. Goldwater Memorial Hospital (not Barry, but Dr. S.S. Goldwater, Commissioner of Hospitals) opened in 1939 and Bird S. Coler Hospital in 1952. The rest of the island was in ruins by this time. Various plans for park and residential development, which would include a subway connection, began to circulate in the 1960s. Finally, a plan envisioned by legendary architect Philip Johnson and John Burgee was decided upon. The Urban Development Corporation, inaugurated in 1969, hired developers and construction began. The island’s typical residential housing is rather uniform and represents the best, or worst, of 1970s residential design. New housing, including some high-rise buildings, have appeared in recent years, in place of the old Goldwater Hospital complex. Roosevelt Island’s first permanent resident was Captain John Manning, a disgraced British naval officer who had allowed Fort Amsterdam (on Governor's Island) to fall to the Dutch in 1673. Upon Manning's death the island was passed on to his stepdaughter Mary and her husband, Robert Blackwell, and the island stayed in the Blackwell family until 1823, retaining the name "Blackwell's Island" for decades after that. 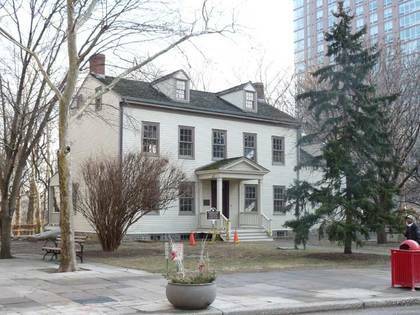 The oldest building on Roosevelt Island is the Blackwell farmhouse which dates to 1794. In 1828, the farmhouse was purchased by the city, and it later became the administrative center for the succession of institutions that sprung up on Blackwell's Island beginning that year. 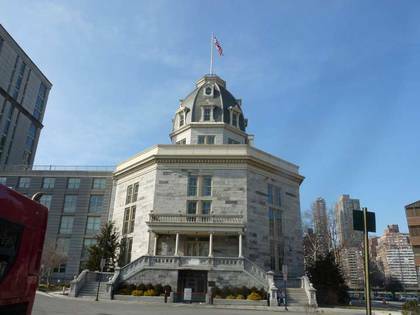 In recent years, the city has shored up and refurbished the house, which would make an excellent museum of the island’s history, if the city would make the investment. 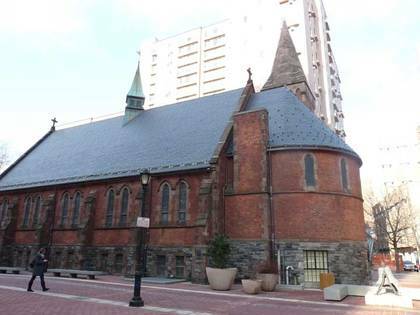 The oldest church on Roosevelt Island, the Chapel of The Good Shepherd (Episcopal), was built in 1889 by Frederick Clarke Withers and was restored when new development came to the island in the early-1970s. It was a gift from banker George Bliss to the Episcopal City Mission Society to serve patients and inmates on the island. Since 1975 it has served as a community ecumenical center. 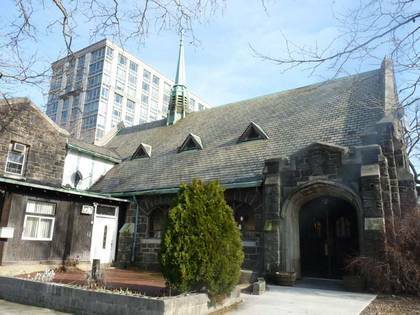 It turns out that Roosevelt Island’s other old church is also an Episcopal church. Built in 1924 on River Rd. facing Manhattan from island-quarried gneiss as a chapel for Metropolitan Hospital, with an attached rectory for the hospital’s chaplain, it stood abandoned between 1955 and 1975 after Metropolitan moved to Manhattan. It has subsequently been the Redeemed Christian Church of God and the present Dayspring Church. 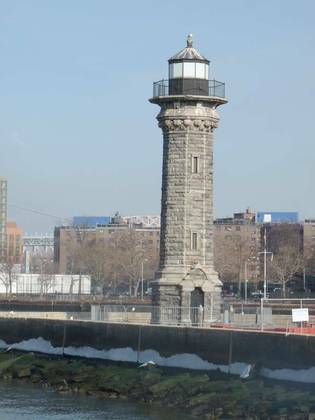 It’s located on the west side of mid-island facing Manhattan. Unfortunately, the current congregation is starved for funds, with several of the stained glass windows in ruin. When I first encountered the domed building known as the Octagon in the mid-to-late 1990s, it stood behind a barbed wire fence, with just its octagonal stone base remaining from a large asylum that had featured a central Beaux-Arts dome. It had been the remnant of Blackwell Island's first lunatic asylum, first constructed in 1839, opened in 1841. On a New York City visit in the mid-1840s, Charles Dickens commented on the building’s rotunda, but decried the treatment given inmates there. Elizabeth Cochrane, writing under her nom de plume Nellie Bly, feigned mental illness to gain admission and wrote an exposé on the asylum in 1887. The building was renovated and renamed Metropolitan Hospital in 1894 and remained in that capacity until 1955. After that, arson and general neglect had destroyed the old asylum until it was rebuilt as a pricey residential complex in 2002. Lighthouse Park, at the island’s northern tip, is named for the lighthouse built by architect James Renwick Jr., who also built the island’s Smallpox Hospital, in 1872. It replaced a small fort built by Thomas Maxey, a patient in the nearby “Octagon” lunatic asylum.